“Each year, Yosemite National Park welcomes over four million visitors. If you are planning to visit Yosemite, plan ahead and arrive early. In summer, expect extended traffic delays and extremely limited parking. Expect delays of an hour or more at entrance stations and two to three hours in Yosemite Valley . . . If you are planning to visit Yosemite valley by car for the day, arrive before 9 am, after which parking is usually full. 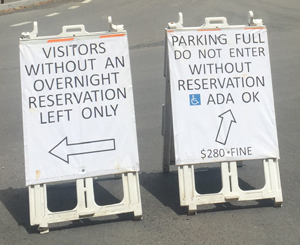 Parking is available at Yosemite Village, Half Dome Village (formerly Curry Village), and near Yosemite Falls. If you find a parking space, plan to leave your car there; you will not be able to find another parking spot. Use the free shuttle to get around Yosemite Valley. If you have lodging or campground reservations, park your car at your lodge or campground and use the shuttles to get around. and help make your visit more fun. See also: services (minor emergency repairs, propane service, towing for some vehicles), at the Yosemite garage. It is against the law to sleep overnight in your vehicle in a Yosemite parking lot, by the side of the road, etc. There are many more crosswalks, often not at intersections, than you might be used to at home. Rarely, (most often in storms with heavy snow or rain) all the roads out of the park can be closed for part of a day or even for multiple days, so you should not have a tight schedule to get home. It would be wise to have a map of, and take a look in advance at, alternate routes that might be your new way home if only one of the roads out of the valley opens up. Sometimes one or more roads are closed suddenly due to a rock fall / mud slide that needs to be cleared. Roads that were two lanes in the same one-way direction can need to be be designated as two-way. Watch for signage. Sometimes roads are blocked by people who ignore large signs warning them to not go any further with their not-so-small-vehicle, see the TURN AROUND NOW below in the RV section below. 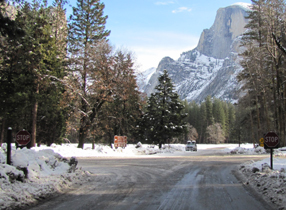 Rvs should head for the Yosemite Falls day-use lot or the small RV only parking area at Half Dome Village. RVs and trailers are not allowed to park at most of, sometimes all of, the main Village grocery parking lot. 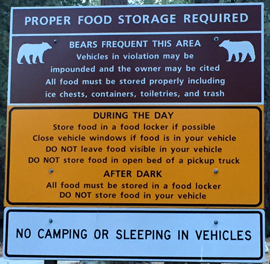 OR, since parking (except at your assigned campsite) is severely limited for RVs, the park suggests that you consider parking outside the park and getting a bus ride in: https://www.nps.gov/yose/planyourvisit/upload/rideyarts.pdf This advice notes that this can be much easier and less time consuming than searching for parking or trying to maneuver in tight traffic. Upper Pines, the winter Yosemite valley campground that has parking spaces at each campsite, has a 35 ft / 24 ft length limit. One of the biggest regrettably preventable causes of warm months and holiday weekends traffic in the afternoon is because many people do not consult maps before they go to the park. A significant number take the wrong route to their overnight accommodations, or when trying to find parking or trying to leave the park. Most of the valley roads are one way (except perhaps after a road closure due to rock fall). 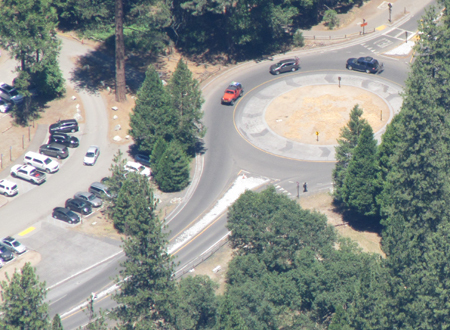 All traffic coming from Half Dome (curry) Village and the Pines Campgrounds must exit through the one-way counterclockwise Round About at the intersections of three roads. 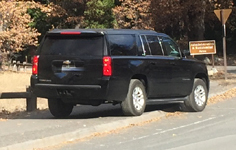 A significant number of vehicles trying to find the Yosemite Lodge, lodge day-use parking, the entrance to the village day use parking, the Majestic (Ahwahnee hotel) head up the road around the Yosemite Village day use parking lot, turn around in the round about and go back the way they came. 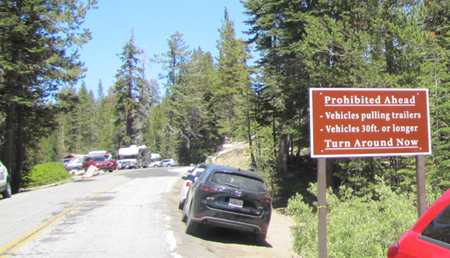 Since the round-about is only one lane, and again is the only route out of the park from Half Dome Village and the Pines Campgrounds, the roundabout becomes a major traffic gridlock / slowdown . – – – – – There are YIELD signs at the round-about, but not all drivers yield. If you have never been to Yosemite, I’d like to suggest taking a look at detailed driving directions from the Bay Area I created for college students on trips from the college I teach at. If you are sure of how to get to where you want to go in Yosemite valley, but have not been to the valley recently, I would like to suggest that your drive could be less frustrating if you take a look at a map and descriptions of the roundabout. Your trip will be more pleasant if you do not need to go to Half Dome Village or the Pines campground in the more crowded months if you skip driving all the way up southside drive . During high traffic times, especially on busy weekends in the summer, the main intersection at Half Dome Village is sometimes partially closed and people without reservations for lodging there or a pines campsite wait in a slow stop-and-go traffic backup only to be turned away. 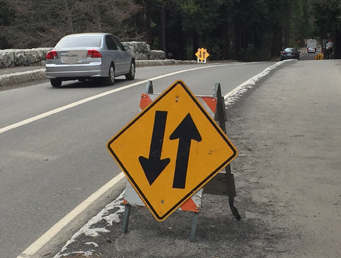 The road ahead to the Pines campgrounds might be blocked off and a ranger might be directing people who do not have reservations for Half Dome Village or a Pines campsite to turn left and not try to park in the full parking lots to the right. During the February Horsetail Fall natural firefall, lanes of some roads are closed either to vehicles and/or pedestrians. Road-side parking (parts of both Northside and Southside Drives as well as El Cap crossover) and turnouts, many parking lots and picnic areas are closed to parking, and some years you need a permit to go to where you can see this natural light show. Watch for signage. Wear warm clothes, waterproof boots, possibly waterproof outerwear and carry a flashlight or head lamp, since your cell phone will not function as a flashlight long enough or brightly enough. All campsites except in Camp Four and Backpackers walk-in have parking for two vehicles (and at some sites a long trailer / RV) at each campsite. The campsite reservations system lists the maximum length of vehicles for each campsite. See also winter camping advice. At the Lodge and Half Dome Village cabins with a bath there are some UN-assigned parking spaces near or next to most buildings, and parking spaces might be occupied by someone else when you arrive. A few of the Half Dome Village canvas tent-cabins and most of the cabins with a private bath are very near potential parking spaces, but again, parking spaces might be occupied by someone else when you arrive. At the Ahwahnee hotel (temporarily named the Majestic Hotel) there are some UN-assigned parking spaces (again that might be occupied by someone else when you arrive) and the hotel has bellmen / valet parking at a drop off entrance (covered, out-of-the-weather) to the main building, but the cottages (AKA cabins, bungalows) are a short or long walk out in the weather. 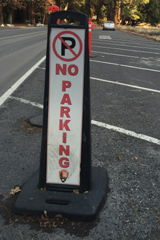 “There is no overnight parking allowed in the Village Store, General Office, Church Bowl or other parking lots as signed. 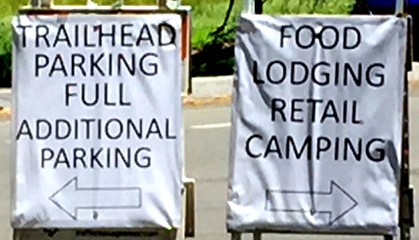 There are three large free day-use parking lots in Yosemite valley for people who are staying at hotels/campgrounds outside of Yosemite valley or just driving up for the day from across the state. When you find parking, take a picture on your smart-enough phone of your parking space / vehicle from a few steps away, so you will be more likely to be able to find it. Note which bus stop you were closest to. 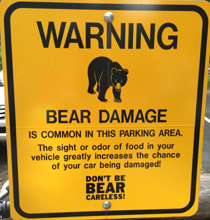 People who are not careful about looking around when they park do occasionally “lose” their vehicles. – – – The Yosemite Village Day Use parking is a short walk to the main Visitor Center, biggest grocery, museum, Post Office, restaurants), no RV or trailer parking allowed. This free day use parking lot is served by stop #1 on the free shuttle bus system. 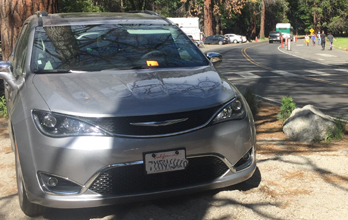 Again, Yosemite Village Day Use parking does not allow trailers or RVS. 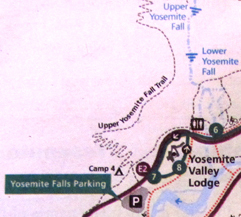 – – – Yosemite Falls day use parking lot is across the road from Camp Four and at the edge of Yosemite Valley Lodge. This free day use parking lot is served by stop #7 on the free shuttle bus system. The very back of this parking lot next to Yosemite Lodge has a long, wide row, separate from the rest of the parking, for big tour buses only. 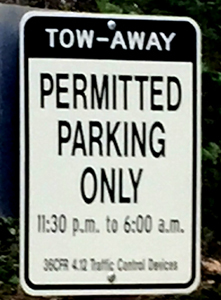 – – – a smaller day use parking lot at Half Dome (Curry) Village . There is a larger copy of the above photo at the map. You can use that page to help identity the few spaces for RV only, and the spaces set aside for guests staying at Half Dome Village. The Half Dome Village free day use parking lot is served by stop #14 on the free shuttle bus system. there are some lots with NO DAY USE PARKING ALLOWED. or government vehicles business-use-only lots, as they are signed and their use is often quite obvious. Parking at the Medical Clinic is only for customers, no day use parking is allowed. People parking at Camp Four campground across the road from the Lodge MUST have a Camp Four camp space permit, 24 hours a day. 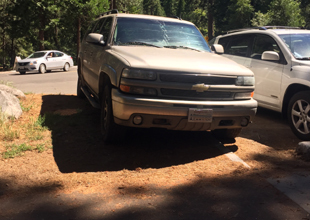 The valet parking only spaces in the far end of the parking lot at the Majestic Yosemite hotel, and the valet parking only lot down a dirt road at the back of the hotel parking lot are, you guessed it, for valet parking only. There are various roads among lodging that are really only for custodians, etc. and their trucks can be parked there, but you can’t. No RV or trailer parking allowed in the Village Day Use parking lot, the spaces are too small and the roadways too narrow. Some roads have signs indicating they are for authorized vehicles only. 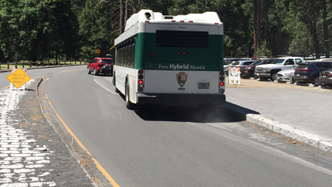 For example, some of the roadways the free shuttle buses use, especially in the Yosemite Village area, are only for the shuttle buses or occasional park service vehicles. A road that leads uphill just past the main (village) grocery store has authorized only signage, as it does not lead to any public parking, but goes instead to employee housing, warehouses, maintenance / storage, barns, the jail, the courthouse, Search and Rescue, law enforcement offices, the fire station and the elementary school. 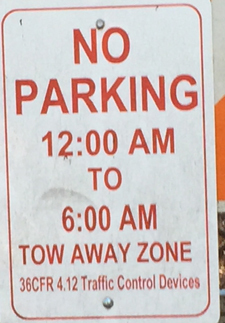 None of these areas are intended as day-use or other public parking and people are towed. Does this driver park on sidewalks at home? Did the many adult passengers really not notice the height of the curb, to be able to tell the driver that they were perhaps not parked where they should be? When a helicopter needs to land in the Ahwahnee meadow across the road from Church Bowl, to pick up someone who needs to go to a bigger hospital, (or when a helicopter needs to land for Search and Rescue training) people are asked to stay on the restroom/picnic area side of the road, and traffic going through is briefly stopped. 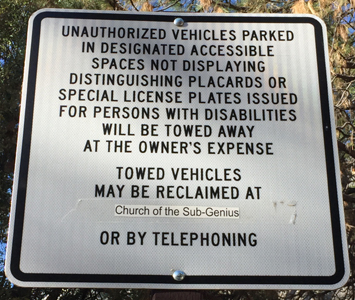 Because you won’t know a helicopter is coming and won’t be able to move your vehicle fast enough, the entire meadow side of the road at Church Bowl is closed to any parking at all times, (even to get out and quickly take a picture or use the restroom). Did they not see the two signs at the side of the shuttle stop driveway/shuttle parking space? Each space in a parking lot is usually paved, has painted stripes and has a concrete beam your tires would hit to keep you from going too far (see the car on the right). In this photo, the driver of the SUV on the left decided to move into the dirt/plants to the side of a parking space at the end of a row, with tires slightly into the legal space already occupied by someone else. Ooops, tires partially in that space does not make it legal. Did this driver from Arizona move the no parking a-frame sign over, or was it already moved over and he choose to ignore the sign, red cone, “No Parking” in large letters on the pavement and two giant trash dumpsters? when a Ranger confiscated it from their open pickup truck bed. See also an index to over a dozen park webpages with park laws, rules, regulations and policies.